Color Platform is devoted to bringing the opportunities of a decentralized platform for daily life. Our unique parallel consensus algorithm, cloud-based blockchain, and advanced governance architecture solves the issues of existing decentralized systems. The New Blockchain Standard. Think Color. We are still reliant on prototype level dApps that are plagued with scalability issues. Color aims to revolutionize the dApp ecosystem by developing Enterprise-Level dApps. The Color Team has dedicated massive amounts of resources to build Mega dApps. Currently, there are already more than 10 dApps being developed on the Color Platform. Color dApps are powered by the single unifying Color Coin (CLR), thereby making all the applications interoperable. Changki is the foremost blockchain evangelists in Korea. He founded one of the earliest blockchain project in Korea and serves as a keynote blockchain speaker. Changki is most renowned for founding Paxnet Inc., the Bloomberg of Korea. He has also founded Finger Inc., served as the London Office Manager CJ, and acted as the former head of the Financial Engineering Research Center at the State University of New York (SUNY). Nikolay Pakulin graduated from Faculty of Control and Applied Mathematics, Moscow Institute of Physics and Technology (MIPT) in 1998. He is a senior researcher at the Institute for System Programming of the Russian Academy of Sciences (ISPRAS) where he has 17 years of enriched experience. He obtained a Ph.D. degree for work on "Formalization of Standards and Test Suites for Internet Protocols." He received his B.S degree in Industrial Management at KAIST. He has held CEO position in Korea Enterprise Investment Co., Korea M&A Co., and KTB Entertainment Co.. He has also participated in foundation, investment and management of various internet companies such as Auction, JobKorea, NDoors and MaxMovie. Junmook Kim has held various positions including CEO of the Korea Culture Promotion Inc. and president of the Sports Seoul, and he also considerably contributed to accelerate consumption of the gift vouchers. Currently, he is working as a chairman of the Innovative Economy Forum and focusing on fostering venture businesses based on his broad business consulting experiences. Young is a software professional having broad experiences from development to top management, from theories to practices at various global companies and organizations including NVIDIA, Samsung Electronics, SK Hynix, North Carolina State University. He has expertise in software engineering, compiler and language technology, and blockchain. He is also experienced in Investment analysis and due diligence for M&A. John David is a Chief Fintech Strategist, Bitcoin & Blockchain Evangelist & Investor. He is also a Certified Bitcoin Expert from Blockchain Council, California. He has been involved extensively in the Blockchain & Cryptocurrency Markets for the past substantial years. He is the Founder of Global Legacy Alliance PLT, a Business Solutions Consulting firm in Malaysia and CryptoTech Ventures & Consultancy Limited in Papua New Guinea. Jill Carrigan is a Chief Operating Officer of IngleDodd Media, and she has over 20 years of experience as a founder, innovator, and early-adopter of multiple online businesses in entertainment, music, subscription, and retail industries. She is also a renowned entrepreneur who has completed Executive Blockchain Program at Draper University, located in California. Jackson Byun has exprience in running an E-commerce company and fund management. Currently he is working as an assistant manager in finance team, and in charge of cryptocurrency analysis and fund management. She received her degree in Language. She has experience in planning and managing online chatting and music streaming at Neowiz. After working at a FinTech start-up, she is now the service planning manager at Color Platform. Brandon has spent most of his career in IT for large organizations like Microsoft, Lockheed Martin, and AT&T. Brandon has been a cryptocurrency expert since 2013, and now assists various teams at Color with technical writing, planning, and even blogging. He graduated from Kwangwoon University, and has been analyzing white papers based on insight into blockchain technology and platforms through access to the blockchain technology and participation in cryptocurrency investments since end of 2016. In Jeju, he gained various planning experiences as a cultural planner, interviewer, and facilitator, and analyzed diverse blockchain projects through blockchain developers meetings. Recently, he gave lectures for the non-developers at the blockchain meetups. Currently, he is in charge of offline networking and community building at the Color Platform marketing team. She graduated from DongGuk University and has broad experience working in NewYork in International Sales and Marketing field. Currently, she is a community manager at the Color Platform marketing team, and in charge of advertisement and community management. He received his B.S. in Civil Environmental Engineering from U of I and organized Global Hackathon Seoul 2015. He has vast experiences in development and data analysis from his startup and Udacity online mentoring. He is currently writing the white paper for Color. He is responsible for planning and developing web services and database related development. He participated in various works related to studying the online platform as a social tool. He is convinced that the decentralization will be the leading characteristics of the future society and is now searching for models that link these with the technology governance affiliated with blockchain. She has worked as game designer and product manger in various companies such as NHN, CJ internet, and as Social media & Local based service product designer at SK C&C Metaverse project. She is now working as a Product Manager at Color Platform. IntroductionSo you’ve heard about Pixels, and now that our ERC-20 has been released and the bounty payments are going out, a few of you may have had a chance to view the code of our ERC-20 contract, and you’ll find that this contract has a few more things going on than the basic minimums of coin transfer requirements outlined in ERC-20, so today we’re going to step through the biggest differences, and what we hope will be solved in the introduction of the MainNet.The ContractEthereum Accounts, Addresses and ContractsThe above contract is our official Color Coin contract and it will also be used to calculate and send Pixels, once the counterpart application is ready for prime time. At nearly 800 lines there are a couple of things we need to unpack. One main thing being, how are pixels accrued, sent, and what are the costs, who pays for it, and when, etc.Conversions — How are pixels accrued and converted?We covered this in some of our previous blog posts, but we’ll cover the basics again here. New Pixels (Pixels that have not been sent) are issued at a rate of 5 per day per person but are only sent to those who don’t have a balance of New Pixels and must be sent in order to potentially become COLOR. The idea is centered around the ‘Gift Economy’ and having a community that is incentivized to be engaged and give to other members of the community. Only pixels sent by other people will turn into COLOR, at a rate defined by the following formula:PIXEL WEEKLY ISSUANCE ÷ PIXELS SENT = COLOR PER PIXELSo if we take the following scenario, in a given week 9,500 Pixel users send out 5 pixels, meaning that 47,500 pixels will get sent out, that would equate to each of those Pixels being converted to about ~4.20 Color. So if you sent 5 Pixel to one recipient that week, they would get about 21 Color. Not bad, eh? However, there is a 50 Pixel conversion minimum to reduce spam and our gas costs while on the Ethereum Network.Pixel ApplicationPixels will be sent through an application that requires each user to have a verified KYC ethereum address. This will be a user-friendly hub where you can search for your family members, friends, charities, and various organizations to send Pixel too. The Color Team will work to get charities, and important organizations on board, while we leave it up to the community to get their family and friends involved! We have lots of plans for what we want to do to make the act of sending pixels more interesting, engaging, and rewarding, so stay tuned for that in future blogs where we dive into our plans for how that will work! At the end of the week however, it is the Pixel application that feeds the pixel amount, pixel address and conversion rate to the Ethereum Smart Contract shown below.Batch SendsIn The Color Token, we introduced the ability to perform Batch Sends. What this allows us to do is instead of processing each transaction individually on the blockchain, we can update the balances of Color wallets in a batch. There exist two functions within our contract to do this, one being slightly cheaper than the other. We will explain both here:So if the above just looks like a jumble of random words and symbols to you, that’s OK, let’s break it down. Essentially what is happening here is that this function takes two arguments (values), pixel amounts and pixel addresses. It then takes those amounts from the Founder wallet, and sends the Pixel accordingly, and converts them to Color based on the (bolded) above conversion rate function that is calculated and provided from the Pixel application.That is slightly different than another method that exists within our contract (shown below). Notice that the argument below has fewer lines of code. For that reason, it is more cost effective for the Color Project, as every line of code means we need to compensate the Ethereum Miners that much more for the more work they provide. Since we assume there will be a large amount of people simply sending 5 Pixels to friends, family, and other community members, we assume that we can use the function below for balances that are the same, to cut costs. The function below simply splits a given amount of Color evenly amongst all the addresses provided. This function will most likely be used for amounts like 50 (the minimum) or 70 (the max you would get if one person sent you pixels everyday.So, who pays for these Batch Transfers, anyway?Ah, perhaps the most important question of them all. If we are sending out these batch transactions, who is going to pay, and what happens on MainNet? For the time being, we estimate that handling the current flow of pixel transactions to be fairly cheap, so it isn’t that much of a worry. By our estimation, using the current safefast calculations and ethereum prices, it would cost us about $1.50 per 300 addresses sent on ethereum. (Calculation table below).These fees will be paid by the Color Project while the project is on Ethereum, and once it is moved to MainNet, Pixel transfers will be embedded as a core part code and will be likely paid as a small percentage of the treasury (still TDB). If we became a project with 10,000+ active users in Beta, and the Ethereum price quadrupled, or the gas price was unusually high, we might instill higher thresholds (minimums), or perhaps wait a little longer between Pixel settlements. Once we hit Mainnet, pixel payments will settle automatically on a weekly basis, without exception.Also, another thing to keep in mind is that if we have a large number of active KYC required users in our Pixel program, we could maintain a high number of users even for a fairly cheap price at current Ethereum prices. For example, if we had 10,000 recipients of Pixels, it would cost the Color network ~$54 USD to send to those recipients each week. To top it off, all these calculations are based on new addresses. Updating address balances are actually much cheaper (around 30%)!To sum up, Pixels will be sent through novel means via a KYC required application. Once sent, those Pixels will then be converted at a fixed rate viewable on the blockchain and distributed weekly to everyone. This is made possible by Batch transfers and will be paid for by the Color Project while in beta. In time, all of this will be automated and be part of Mainnet, and the cost side will simply cost Color and not require continuous injections of Ethereum to keep running.Any questions? 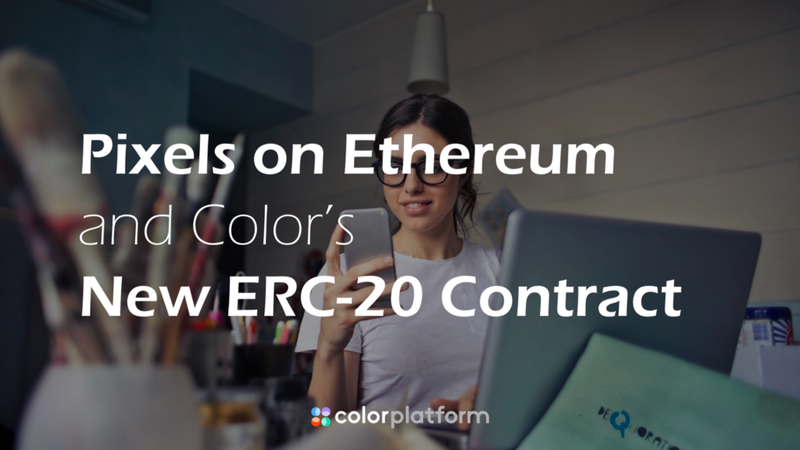 Feel free to leave a message on our Telegram channel!Color Platform (COL)Pixels on Ethereum and Color’s New ERC-20 Contract was originally published in Color Platform on Medium, where people are continuing the conversation by highlighting and responding to this story. ③ Colorcoin is a Cryptocurrency that is designed to be evolutionary-friendly.<Selection>Color Platform will be chosen by both users and developers due to its built-in user convenience and developer friendliness. Users will use dApps on Color Platform in everyday life with faster transaction speed due to a second of block confirmation time. Also, developers no longer have to go through a process to learn a new language to develop their apps. The Solidity of Ethereum, the Haskell of Cardano, and the Okaml of Tezos are programming languages that not even one percent of the world’s developers use. The fact that developers need to learn a new language, or a language that is inconvenient to use, in order to develop a dApp on these platforms is a fatal disadvantage. However, Color Platform not only enhances transaction speed through ‘Spectrum’ technology, but also allows developers to use various programming languages and tools that they are already comfortable with.<Reproduction>Color Platform aims to attract 100 million daily users through the Color coin distribution program ‘Pixel Program’ within a few years. Five pixels per day will be sent to all KYC’ed wallets. Pixels have value only if they are sent to others within 24 hours and will be converted into Color coin once a week. This will encourage fair distribution and continued usage of tokens and would resolve the gap between the rich and the poor. There are also numerous examples of pixel utilization. People can send Pixels to friends they want to be close with, as gifts to their favorite celebrities, aid disaster relief, etc. Existing Cryptocurrency wallets are not used very often but Color Coin wallets will be activated through The Pixel Program, and will spread rapidly. Couple that with the one-currency for numerous dApps feature so the network effect is maximized.<Variation>Color Platform is a self-evolving platform. Color council will vote to utilize a treasury to those who suggest ideas for Color Platform to evolve in a better direction. As we can see from the recent Bitcoin Cash hard fork dispute, many Cryptocurrencies and its stakeholders fight for their own interest. This results in choices for certain individuals only, which in turn prevent the development of the platform. However, Color Platform will make changes in a rational, autonomous and positive direction in which the platform can evolve through its efficient governance system.Color is not just another blockchain platform. It is a platform that is ready to be chosen by users by forming a ‘fit order’ through competition. Just as only the chosen kind that created a ‘fit order’ through continuous replication and variation has survived in the natural world, Color Platform is designed to be a leading platform.Color Platform (COL)Crypto Predictions: What to Expect in 2019 was originally published in Color Platform on Medium, where people are continuing the conversation by highlighting and responding to this story. 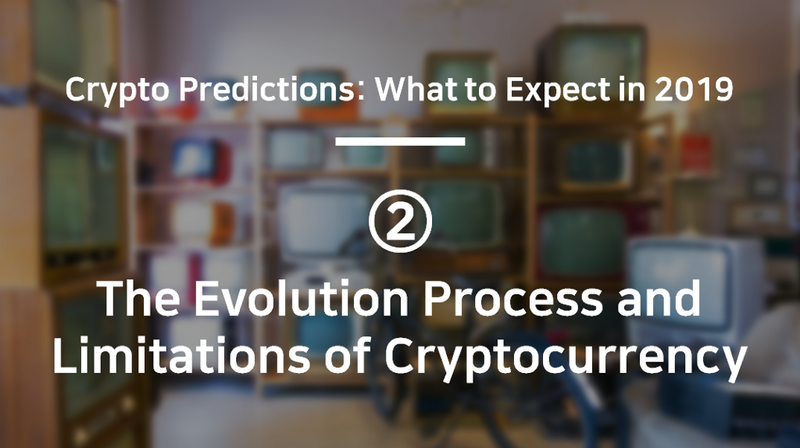 ② The Evolution Process and Limitations of CryptocurrencyLet’s look at the evolutionary history of Cryptocurrency thus far. The era of Cryptocurrency emerged when Bitcoin was born. With Bitcoin, the concept of the ‘global single bank’ arose. Not long thereafter, the second generation of cryptocurrency, Ethereum, was known as the ‘global single computer’, turning the concept of smart contracts into a reality. Later, the 3rd Generation of Cryptocurrency such as EOS, aiming to be the Ethereum Killer, as well as Cardano and Tezos have been introduced to overcome limitations of the previous generations of Cryptocurrency.Transaction time and speed are a problem in Bitcoin, as well as that of smart contract in Ethereum. Even the highest used dApps on Ethereum and EOS have less than 500 daily active users. Bitcoin Cash clearly revealed the limitations of PoW structure due to the recent hard fork dispute and proved to fail on decentralization as well as wasting energy.From an evolutionary economics perspective, existing Cryptocurrency was not chosen by users. During the 19th century, steam locomotives emerged and soon led the industrial revolution, moving large quantities of cargo by train, not by ship. However, the steam engine disappeared into history with the advent of diesel engines with faster speed and cheaper cost. This is a natural order from an evolutionary point of view. The same is true of Bitcoin. The reason why Bitcoin is not collapsing yet is because it is the ‘first’ Cryptocurrency,’ has brand value, and there’s no strong competitor that has emerged yet. Bitcoin and Ethereum waste huge amounts of energy and do nothing to address the gap between the rich and the poor. As soon as a cryptocurrency solves this problem, the aforementioned frontrunners will follow the course of extinction sooner or later.#1 Birth of Bitcoin and the CryptocurrencyIn January 2009, Bitcoin’s 10-year-old history was born with the coevolution of telecommunications, cryptography, and computer advancements, just as a new species of dinosaurs were born and changed the world based on the heritage of amphibians and reptiles. Bitcoin is the world’s first private-sector international currency and also a cross-border international remittance system, creating a new order that is different from the existing financial system.#2 Ethereum and Smart ContractsSmart Contracts are neither smart nor smart nor legally binding. Although the name is misguided, anyone in the world can utilize this single computer system to make a semi-automated transaction based on certain conditions. Thousands of dApps have been developed on this platform, but nothing has been widely adopted or commercialized yet. This is like a new species being born that hasn’t fully adapted to the environment.Ethereum offered breakthroughs, however, the energy waste is simply too high from an economic evolutionary standpoint, making it slow and expensive. Although the Decentralization Dogma is rampant, it tends to be more centralized than people realize. The Trilemma problem essentially says that in the current understanding of cryptocurrency, you must sacrifice either security, scalability, or decentralization in order to advance the other two areas. As it stands, Ethereum is unable to solve the cryptocurrency trilemma.Bitcoin and Ethereum use the proof of work (POC) Proof of work method to propagate their ledger and are thought to solve decentralization, but it is not practical because it is slow and costly. Moreover, recent battle between BCHABC vs BCHSV during Bitcoin Cash Hard Fork revealed that decentralization is an illusion. The sad reality in the current system about being your own bank is that it is very susceptible to loss and theft. As the issue arose, the price of cryptocurrency plunged again in November 2018.#3 3rd Generation CryptocurrencyThe biggest reason why existing cryptocurrencies are not commercialized is that it takes too long to conduct transactions. In Ripple, due to its faster transaction speed and usefulness in international remittances, it became top 2nd cryptocurrency based on market capitalization. However, Ripple cannot argue that they are decentralized since the developers dominate token supply and decision-making process.Many platforms such as EOS, Cardano, and Tezos have challenged to solve the issue. EOS argues that they have reduced the number of block producers to 21 so their TPS is 2000 with the block confirmation time down to 1.5 seconds. Cardano only has 7 full nodes but their block confirmation time is 240 seconds. It takes 30 seconds to confirm block with Tezos which has 230 full nodes. With this rate of speed, it’s not possible to compete with commercial payment systems such as credit card and Alipay where transaction is confirmed within a second.Have a Colorful Day :)Join Our Chatroom to Learn More!▼Color Platform (COL)Crypto Predictions: What to Expect in 2019 was originally published in Color Platform on Medium, where people are continuing the conversation by highlighting and responding to this story. ① What is Evolutionary Economics?#1 Evolutionary AlgorithmIn Evolutionary Economics, economics is interpreted as an evolutionary principle. Evolution itself is simply the replication and slight variation of a coded sequence, and of course, only those species that adapt their DNA most effectively to their surrounding environment, thrive. In the same way that evolution selects traits for survival, so too do consumers ‘selects’ their companies to survive through their purchases. Creatures breed more offspring to ensure survival, and companies sell as many products as possible by ensuring their products can survive the environment of competition. Charles Darwin (1809–1882) published in 1859 Origin of Species the theory of Evolution which said that ‘Survival of the Fittest’ was the rule of law in nature. Economics is no different.Of the 10 million living species on Earth, as well as the hundreds of millions of life species that have existed, originated from a single organism. Humans, Cockroaches, E. coli, earthworms, anemones, dandelions and butterflies all share a common ancestor. We are all brothers, in a way. DNA double helix makes proteins by making hundreds or thousands of chains of amino acids. Muscles, enzymes and antibodies made of amino acid chains play a crucial role in body composition and metabolism.Tawny RNA, the single ancestor of all life forms, has undergone a number of duplications during the three billion years of replication. As the number of objects increases due to cloning, variations and choices are repeated, and the variety increases. Various bacteria, viruses, plankton, grass and trees appeared, mosquitoes, fish, frogs, snakes, dinosaurs, rabbits, monkeys and humans appeared one by one.Richard Dawkins (1941-), in his 1976 book The Selfish Gene, presented the view that all living things are tools for the survival and reproduction of the embryonic genes that were born three billion years ago. So how does this relate to economics?#2 Evolutionary economicsEvolutionary economics is an evolutionary algorithm that explains economic phenomena. Just like in evolution, it is economic development that produces better products in the process of constantly repeating reproduction, variation and selection. In the process of inventing and developing the wheel, the carriage, the steam engine, the internal combustion engine, the automobile, the generator, the motor, the plane and the electric vehicle, all of which the consumer selected and companies mass produced.More products are produced (replicated) when a better product is developed (changed) and consumers are heavily used (selected). In the meantime, better products are coevolved. Consumers’ preferences change as tastes and trends change, resource prices change, and new technologies are combined. Corporations aren’t so different from people, in that they have to adapt to the environment of consumer demand and competition to survive. Evolution inevitably creates a new order, often referred to as the “Fit Order”. Over time evolution constitutes a more complex order and produces lower entropy. Complex order reduces the waste of resources and makes it possible to respond precisely to the environment.From an evolutionary economic point of view, value comes from the “appropriate order”. In classical economics, it is believed that value comes from a labor, a land and invested capital, but a hypothesis that value comes from in proportion to the labor is a rather narrow viewpoint. A Car made in North Korea by 100 factory workers over the course of a month, could be made in South Korea by 10 workers utilizing robots over the course of 10 days. In ancient times, it could take scholars over an hour for some complex calculations than a college student could perform in under a minute on a calculator. Evolutionary economics explains reality better than classical economics, where value is produced in proportion to the factors of production. This theory was an expansion of Charles Darwin’s Origin of Species when applied to economics by Eric Beinhocker in his book ‘The Origin of Wealth’. Beinhocker explained that origin of value is evolution of order and Fit Order is the Origin of wealth.#3 Evolution of Digital PlatformComputer concepts were developed by Alan Turing that later evolved into the Personal Computer we know today by Bill Gates and Steve Jobs through IBM’s mainframe. During that same time came the introduction of transistors and semiconductors, all the while wired communications turned to wireless communications. As a result, the Internet was popularized in the 1990s as a result of evolving co-evolutionary phenomena in which hardware, communications, and software interacted to make what we know today.Now the era of smartphones, and advances in Cryptocurency are changing the way we do business, and will bring about another source of value for digital platforms. Six of the world’s top ten companies created their value based on a digital platform. Apple, Amazon, Google, Facebook, Alibaba, and Tencent were small and nonexistent 15 years ago, but now they are all top 10 companies in terms of market cap in the world. How do you explain this in terms of the capitalist theory of classical economics and the input theory of labor value theory?Looking back at the last fifty years of economic evolution, several inadequate orders have disappeared, in large part due to the companies or technologies not being able to adapt. Sony’s Walkman took advantage of memory changes, but failed to deliver an MP3 player when the market shifted. Nokia failed on multiple counts to adapt, Kodak film missed the digital revolution, Yahoo, Mainframe Computer companies, typewriter companies, mostly all failed to adapt to the change, and we either need to take conservation efforts (government subsidies, loans, etc.) to keep them alive, or they must eventually adapt or die.If we look at the characteristics of an extinct species that has not adapted to the evolution process, those that are extinct are firstly most likely due to poor energy conservation. Likewise, changes in technology and products that cannot co-evolve are extinct, or just as a partner’s unselected life leaves no offspring and is eliminated from the evolution process, products that are not chosen by the consumer or fail to adapt technology or to social and political change become extinct.Have a Colorful Day :)Join Our Chatroom to Learn More!▼Color Platform (COL)Crypto Predictions: What to Expect in 2019 was originally published in Color Platform on Medium, where people are continuing the conversation by highlighting and responding to this story. Color Platform in ‘WBS Marvels Seoul 2018’! Revealing BTS! The Color team participated in the World Blockchain Summit Marvels Seoul 2018 held at Shilla hotel in Seoul on December 12th. As it is an international event with many blockchain companies and celebrities from all over the world, it was quite a thrill just being part of it. There were many people who came to see the Color team, so we were glad to run the booth and meet everyone!At 7:30 AM, the Color team arrived at the hotel and began decorating the booth. It was a great opportunity to spread awareness about the Color project around the world, so we prepared event banners and brochures, and even special blockchain magazines that feature Chang-ki Park, CEO of the Color Platform on the cover! In addition, the Color team prepared new official merchandise, the Color hooded sweatshirt.After the event started, we introduced visitors to the Color Platform and guided them to participate in the event. Thanks to the Color brochures that we finalized last week, it was much easier to explain about our project than the previous events.At the event, Chang-ki Park spoke as the presenter under the theme ‘The Future of Cryptocurrency in Evolutionary Economics.’ Today’s Bitcoin and Ethereum will waste energy, deepen the gap between the rich and the poor, and will soon be doomed, whereas the Color will win the competition based on the evolutionary economics because Color is designed to be Selection, Reproduction, and Variation friendly.Through this event, the Color team was excited to introduce the Color Platform to a wider audience. We will keep working hard to promote the Color Platform to more current and future Color supporters through active online and offline events. See you at the next event~!Have a Colorful Day :)Join Our Chatroom to Learn More!▼Color Platform (COL)Color Platform in ‘WBS Marvels Seoul 2018’! Revealing BTS! was originally published in Color Platform on Medium, where people are continuing the conversation by highlighting and responding to this story. As of December 4, Color Platform’s official Kakao chat room operation is terminated. Instead, we are running a Telegram channel for Korean supporters.▶ Color Official Korean Telegram Channel: https://t.me/colors_orgPlease join the Official Color Telegram Channel. Color Team will announce the latest updates and news through the channel.Meanwhile, we will continue to respond to your inquiries via e-mail. If you have any questions, please feel free to contact us.▶ Color Official Email: [email protected] are always grateful to our private investors who support us and will do our best to bring you good news about our current private sale. *Color Telegram Channel for international supporters will be still in operation until further notice.Thank you.Color TeamHave a Colorful Day :)Join Our Chatroom to Learn More!▼Color Platform (COL)We’ve closed our Kakao Chat room for Korean supporters was originally published in Color Platform on Medium, where people are continuing the conversation by highlighting and responding to this story. Governance Part 3: What Did We Learn? Last time, we’ve talked about the problem with blockchain governance and had a chance to see what can be learned from other projects. Today we’ll take a look at what some of those problems are, and how Color plans to tackle them.#1 Too Few Block Producers and you’re going to have a bad time.In the army they call this the four eyes principle or individual separation. The less people involved in a particular activity, the higher likelihood of coercion. It is much more likely to have bad actors in a system that allows concentration of power. Also, the fewer people means that they are much more likely to come to a conclusion and push ahead and potentially make bad decisions. Also, having block producers being selected randomly and for other reasons than just how much coin they have staked with them is healthy for the ecosystem. In Color, there are more than twice the amount of Block Builders than EOS’s Block Producers, and with far less power. We believe this design is healthy for the ecosystem to have them not be what Color Coin is, but rather perform an important service and compensated accordingly.#2 Leaving the Governance decisions in the hands of the Block Producers is no bueno.Recently projects like EOS have been having issues with fungibility. That is to say that transactions they approve or disapprove of are simply at the hand of the 21 Block Producers. Are you a rich person who angered the Block Producing community? Watch out, you might get blacklisted. Block Producers have to keep up with Blacklists to ensure that wallets they don’t want to be transacting with the network. If you don’t keep up with these blacklists, you may even be facing a lawsuit, as we saw earlier this year. With Color, there will be no Blacklisting. As it stands, EOS suspends wallets all the time. Fungibility is extremely important to us. There will be no blacklist to update and weekly ‘fungibility restriction’ meetings between our Block Builders.#3 Having a Foundation as part of your governance model if fine, but their funding needs to be revocable and community controlled.Foundations can be an important part of the equation when choosing the direction for the coin and how to direct its resources of devs and marketing and any other efforts and partnerships it may want to pursue. However, when Foundations run a muck it may be a large arduous process until the community annexes them at large. With a treasury system, as soon as their proposals don’t reach the threshold to get funded, and something else gets more support, it is goodbye almost instantly to that foundations funding.#4 Too few “branches of government” and you lose checks and balancesJust like in state governments, centralization of power can be a problem. After all, what good is a decentralized currency if the mechanisms that govern it are centralized and don’t accurately represent the stakeholders across all levels? The problem with many existing cryptocurrency systems is that only a few voices really have a say. In EOS, what the Block Producers say, goes. In Bitcoin and many other projects, many people feel that the Core Dev teams are often too powerful.How then, are we supposed to fix this? With the Color governance the treasury makes it easy for vast amounts of the community to get their voices heard and ideas funded. The entire currency isn’t at the will of the Color Committee. Not only that, but the funding comes from the treasury as well. The Block Builders who provide consensus also have a voice as core members of the community, but their ability to govern is limited such that their voters must continue to agree with their decisions in real time, else be replaced and the Treasury budget will be directed elsewhere.Have any questions? Stay connected with us through our Telegram channel.Have a Colorful Day :)Join Our Chatroom to Learn More!▼Color Platform (COL)Governance Part 3: What Did We Learn? was originally published in Color Platform on Medium, where people are continuing the conversation by highlighting and responding to this story. Color Governance is a complex process and so far, even in our White Paper, we have only scratched the surface. First of all, what is cryptocurrency governance? Cryptocurrency governance mainly comes in two forms:How the rewards are divided, and how that is handled.How code changes occur in the “core” code.This is the second in our Governance series of blog posts where we will see what we can learn from other projects. There are projects that have taken huge risks, some within the field of cryptocurrency governance, and most have not succeeded. But in designing a new governance structure, it first behoves us to take a look at some of the reasons they might have failed.1) EOS — But, But, But…. You Promised?Quite simply, what Vitalik feared came true. How do you avoid vote buying? If this is to continue to be an unregulated space and you don’t want to have vote buying be an option, than you better figure out a way in your code or governance system to prevent this. Simply having governance participants sign a non-binding promissory note that “they promise they won’t do something” is not going to cut it. Last month there was EOS vote buying for their block producers. EOS essentially has a situation where the 21 Block Producers control everything, and you either like your overlords, or you leave. That isn’t governance!2) Cardano — The Foundation BreakupIOHK and Emurgo just left the Cardano foundation due to the lack of progress. Now this doesn’t necessarily mean that governance as a whole has failed, but it just goes to show that governance is hard, and getting it right isn’t something you can do by accident. In this case, if they were using a governance system that took into account community voting, and the funding was given directly from a monthly budget that could be revoked by the community as a whole, this would have never been as big of an issue as it was. The voters would just simply start to see that this wasn’t a good idea and not fund any proposal by the foundation to receive funding. This is Color’s Approach.3) Other Coins — They all have their problemsColor is under no illusion that good governance will be an easy task. Quite the opposite, in fact. Bitcoin has forked so many times that even its forks have multiple forks now. Ethereum still has Ethereum Classic, and another contentious fork on the way. So what can we do to solve this governance crisis? We need to apply what we’ve witnessed to see what works and what doesn’t, quite simply.What Have We Learned? In the next blog post we will cover these topics in more detail:Too Few Block Producers and you’re going to have a bad time.Leaving the Governance decisions in the hands of the Block Producers is no bueno.Having a Foundation as part of your governance model if fine, but their funding needs to be revocable and community controlled.Too few “branches of government” and you lose checks and balancesExtra Credit: Forks may not be a bad thing, but we should try to prevent them.Have any questions? Stay connected with us through our Telegram channel.Have a Colorful Day :)Join Our Chatroom to Learn More!▼Color Platform (COL)The Problem With BlockChain Governance was originally published in Color Platform on Medium, where people are continuing the conversation by highlighting and responding to this story. If you’ve read the whitepaper of Color or other blockchain projects, you’ve probably heard the word ‘governance’ by now. Many people in the blockchain space are interested in discussing TPS, consensus, token economy, etc, but to a lesser extent the governance that makes these decisions possible. Behind the scenes, there is a lot that goes into making these decisions, and they aren’t always easy, as we’ve seen this year with multiple forks of major blockchains.First of all, let’s look into the origin of the word ‘governance.’ Governance derives from the Greek word ‘kubernaein,’ and it means to steer(a boat or ship). In modern English, it now means the actions and processes by which stable practices and organizations arise and persist.However, Blockchain Governance is a decision-making process among thousands of people on how to operate the system rather than one person or organization manage the system.All the individuals involved in the Blockchain Governance might or might not be interested in this decision-making process. Therefore, when designing Blockchain Governance, we need to consider it to encourage members to participate in the decision-making process and prevent dogma and unchecked decision making of half-baked or ill-intended ideas.There are mainly two things to contemplate regarding designing the Blockchain Governance.How the rewards are divided and handled.How code changes occur in the “core” code.Blockchain Governance is an essential element to create a sustainable decentralized system. There is no perfect solution to governance in general, because it is a process centered around the human element for human needs, but in the upcoming governance blogs, we hope to show why we believe cryptocurrency governance participation is not just for the technocrats, and why it is critical that we get everyone involved.Have any questions? Stay connected with us through our Telegram channel.Have a Colorful Day :)Join Our Chatroom to Learn More!▼Color Platform (COL)What is Blockchain Governance? was originally published in Color Platform on Medium, where people are continuing the conversation by highlighting and responding to this story. Hello, Color supporters!What do you think is the most important thing for a blockchain platform to maintain a sustainable ecosystem? Today, the Color team would like to introduce five features that set Color apart from the rest.#1: ‘Prism’, A Parallel Consensus AlgorithmComprehensive Block Builder selection process that is randomized and cartel resistantSpeed enhanced and energy reduction by decreasing data chatter to reach consensusColor’s consensus is a leagued parallel BFT algorithm that leads agreement of 7 continents and 49 Block-Builders. There are mainly two benefits. First, there is a comprehensive Block Builder selection process that is randomized and cartel resistant, making it difficult to determine who will build the next block. For instance, in the case of EOS, people know which Block Producer will make the next block. Therefore Block Producer could become the target of malicious hacking attempts. Second, the Color Platform brings speed enhancements and energy usage reduction by decreasing the data communication amount needed to reach consensus. You will be able to check the technical details with the upcoming blog post after the yellow paper is published.#2: Pixel Program, Color Coin Issuance ProgramNetwork Effect Driven ReferralsThe Pixel Program encourages a fair distribution of tokens and the ongoing use of tokens. Platform users receive five pixels per day, and Pixels will in time, convert to Color Coin. The Pixel Program accelerates attracting new users and boosts token circulation. It promotes the gift economy and achieves the network effect.Whitepaper Explained② — All About the Pixels (Updated on July 24, 2018)#3: ‘Color Coin’, A Global Single CurrencyAll dApps accepts one single currency, COLThe Color team is creating a unified coin that will be usable across all dApps in the ecosystem. This means that even though projects on Color can launch their ICOs and have their own token, the dApps will always be able to be used with Color on the platform in one way or another. In addition, we will leverage partnerships with existing successful applications and transition them to the blockchain world.#4: ‘Color Pay’ The Unhackable Hardware Payment SystemNot only will this payment system be resistant to most hacks, but payments will settle instantly without a third party and even be available offline.Color Pay, a Future Leader in Blockchain HardwareColor Pay In Action#5: ‘Color Spectrum’ Parallel Data Processing TechnologyBlockchain Data Separated from App DataThe Color Spectrum gives the ability to split the data needed for repetitive service processing and blockchain data in its dApp Development Kit. As a result, we have significantly reduced costs such and fees for developers and users of apps. Not only that, but a friendly development environment where you can easily take advantage of cloud storage and blockchain processing will be seamlessly integrated into the developer experience.Have any questions? Send us an e-mail at [email protected] and stay connected with us through our Telegram channel.Have a Colorful Day :)Join Our Chatroom to Learn More!▼Color Platform (COL)Five Features That Can Propel Color the Top was originally published in Color Platform on Medium, where people are continuing the conversation by highlighting and responding to this story.